Juan Bustabad recalled the end of his playing career years later as sad, according to The Saganaw News. Bustabad played a decade, but made it just short of the bigs. "It was sad ... disappointing to get to Triple A and get close to the major leagues and not make it," Bustabad told The News. "As a boy, that's your dream. But after that last year in 1990, the Dodgers offered me a job coaching. It was the right time, the right situation to move on." Bustabad moved on, and soon started his new career as a minor league manager. In his new job, Bustabad helped others on to the majors. Bustabad's career in baseball began in 1980, taken by the Red Sox in the first round of the January secondary draft out of Miami-Dade College. He started at single-A Winter Haven, then made AA Bristol in 1981. In 79 games there, he hit .265. 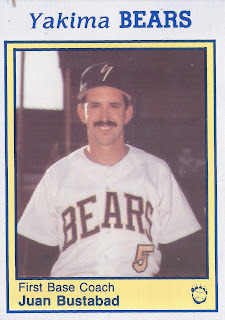 In 1982, he made it up to AAA Pawtucket. He hit .266 on the year. Despite making AAA in his third season, Bustabad never made the last jump. He played at Pawtucket for each of the next three years. After sitting out 1986, he returned with the Dodgers in 1987 at AA San Antonio. He last played in 1989 between San Antonio and AAA Albuquerque. He then turned to coaching and managing. He served as a coach at short-season Yakima. He received his first managerial job by 1994. He served that year with the Gulf Coast League Marlins. He continued with short-season Utica in 1997 and as hitting coach with AA New Britain in 1999. In 2009, with Great Lakes, he won his 600th game as manager. He won his 800th in 2012 with Rancho Cucamonga. In 2006, Bustabad served as manager for the GCL Dodgers. He had both Clayton Kershaw and Kenley Jansen. He used Kershaw as closer in a game, while Jansen still served as catcher. "He was special from Day One," Bustabad told FoxSports later of Kershaw. "He was like a man against boys, topping out at 95 in the Gulf Coast League from the left side. It was just devastating." Bustabad then left the minors and spent time at Oxbridge Academy in Florida.